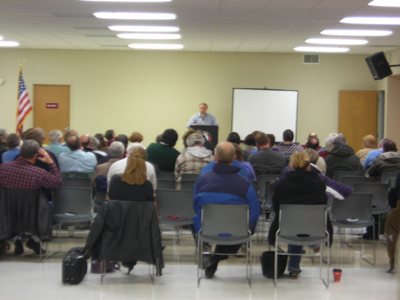 Monday, 4Jan10, I attended the first 2010 meeting of the Leavenworth County Republican Party, at the city community center in Lansing Kansas. Coming in I picked up my name sticker and was directed toward the table with the campaign literature and paraphernalia where they had a box of greeting cards for an Army platoon in Iraq that the local party had adopted. I filled out a card with a brief message. I’m never sure what to say to anybody who’s over there. Nothing seems adequate, so I usually keep it brief and vague. It’s a nice sentiment, though, for them to do it. I think it was the Republican Women group that is sponsoring it, but I’m not entirely sure. 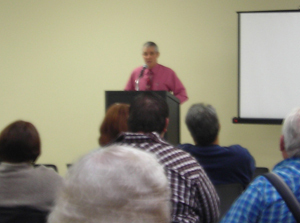 After local GOP Chairman John Bradford opened up the meeting with the Pledge of Allegiance. I’m not entirely keen on the recitation of creeds or pledges, but I don’t really have anything against the Pledge of Allegiance either, so whatever. I tried to picture a local Democrat party starting off with the Pledge and just couldn’t do it. The primary guest speaker was Congressman Todd Tiahrt. He was scheduled to speak second, but somehow or another they decided to reverse the order. He began by telling us how his forefathers came to Kansas in 1893, and like many people they came looking for opportunity, not handouts. He talked a little about working down in Wichita for Boeing, then as a Kansas Senator who in 1994 rode the “Republican Revolution” of Newt Gingrich into Washington. He made several comparisons between the current situation and those initial two years of DNC dominance under President Clinton’s first term, and the general idea is that everyone expects a similar sea change in reaction to the Democrats runaway spending. He mentioned the Chinese assertion that “there is not enough wealth in the world to fund U.S. overspending” as an example, and linked current DNC strategy to the Depression Era policies of Hoover and Roosevelt. Congressman Tiahrt carried the audience with a sober yet energized talk, and really came across positively in the Q&A section. He fielded questions on how the Republican plan to pay down the national debt and spoke of the five things he’d like to see from the U.S. government in the future: energy independence, regulatory reform, litigation reform, tax reform and health care reform. I had to go to his website to find anything to disagree with him on, the so-called “defense of marriage” act, which is neither here nor there as it wasn’t discussed this evening. After listening to him speak tonight I wouldn’t hesitate to say that I support him, however. You’re never going to find a politician who you agree with 100%, and the issue of reigning in government spending and the creeping authoritarianism of the Federal government is the most important issue at the moment. 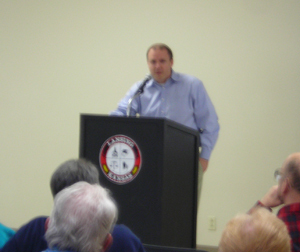 The next speaker was District 14’s State Representative Lance Kinzer. 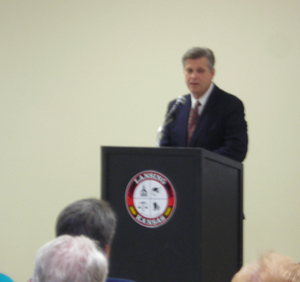 Representative Kinzer gave a speech about the obligations of freedom. He focused specifically on the difference between subjects and citizens, and pushed Benjamin Franklin’s sentiment that “those who would give up liberty for safety deserve neither”. He spoke of our problems being broader than simply political, but as entitlement society becoming ingrained in Americans, and we Americans being at a turning point where we have to decide what sort of relationship we truly have with the state. He spoke, after reading from the Kansas Constitution’s preamble, about our forefathers viewing our rights and privileges being Divinely installed. This formerly radical notion is less Bible banging than some might think, because the alternative and archaic view was that some god gave all his earthly authority to some king, and the people only had what rights the state allowed them. Far from being an attempt to make Jesus president, this is a reminder that WE gave the government authority, and what authority we never gave the government specifically is our retained privilege and freedom. It’s a concept that seems to be shifting as more and more people turn to the government in supplication, willfully throwing themselves and their freedoms and all the inherent dangers of being free, for the safety and comfort of servitude and subjugation. He’s not a great public speaker, but his message is on target, and for that I forgave his long winded and repetitive manner. Chairman Bradford ended the meeting with announcements. We were urged to attend the annual Lincoln Day fundraiser, for instance. I may go, but I doubt it. It’s a fundraiser and I don’t have any funds to contribute, being a mendicant university student. The birth of a child was announced, and the guest speakers of next month’s meeting were announced. It should be interesting. Next month will be an “in-house” meeting, meaning the speakers will all be local county party members, including my old schoolmate Todd Thompson, who is now our County Attorney, and the Leavenworth County Sheriff, along with a couple of local district candidates whose names I could not write down fast enough to remember. While I was gathering my things to leave the local GOP Vice Chair Connie O’Brien approached me because I was wearing my KU College Republicans T-shirt and handed me a cheque to donate to our school club, which was extremely cool of her. Come check it out. I’m still figuring out all the ‘bells and whistles”. Good recap of the meeting. Perhaps I’ll catch you Monday. I am planning on being there Monday, so maybe we will run into each other. Last time I came in a bit late and left right after, which is probably why you didn’t see me. I checked out your blog and it looks interesting. I’ll add it to my blog roll and keep up with it!